A line of steel backing flanges engineered using our patented design. The backing flanges are an integral part of the KC Sealing System of gaskets, backing flanges. KC Multi-Ring Products, Inc. gives the UPW user the most comprehensive and best-designed system for sealing and installing critical flanged joints. 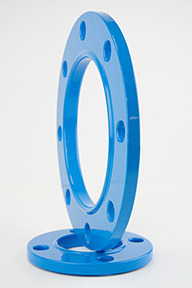 The KC Multi-Ring® backing flange directs the clamping force toward the pipe I.D. Comparative tests on 225mm/9″ piping run at our state-of-the-art sealing test facility indicate that after bolt-up, conventional backing flanges deflect and single-point load the outside edge of the pipe flange, creating its seal on only approximately the last 1 /4″ of the flange face. With conventional backing flanges, the clamping force is approximately 2″ outside of the pipe I.D. This in turn allows the flange face to deflect at pressures greater than 105 psig (lower than most users’ initial hydro test) which allows hydro test medium and contaminants to be trapped between the flange face and the gasket surface. This is an ideal breeding ground for bacteria after the hydro test and flushing sequence. These contaminants may be introduced into the system to contaminate the end product, or plug down-stream filters, whenever the pressure at any joint is raised above 105 psig by water “hammering” when valves open and close during normal system operation. Conventional backing flanges have been known to distort the flange adapter, resulting in a “cupped” thermal set, particularly when installed with elastomeric gaskets. The KC Multi-Ring® backing flange design, which directs the clamping force toward the pipe I.D, eliminates this flange distortion and will, over time, return a “cupped” flange adapter to its original flat state. Our tests further indicate that when the PTFE over EPDM gasket is used with conventional backing flanges, the clamping force is directed outside of the PTFE cover, which may allow the medium to contact the EPDM substrate. On the other hand, the KC Multi-Ring® backing flange is loaded at a point at or near equilibrium. This means that equal, or near equal, clamping force is distributed from the I.D. to the O.D. All the while, the oint of contact remains at a given point during tightening of the flange bolts. Independent Finite Element Analysis results show better loading and less flange stress than conventional backing rings, and the KC Multi-Ring® gasket is stressed equally and maintains a seal at the I.D. of the pipe. Properly installed, there should be little or no bacteria breeding ground with the KC Multi-Ring® UltraPure gasket installed with the KC Multi-Ring® AC backing flange. Unlike conventional backing flanges, the KC Multi-Ring® backing flange provides a positive seal before, during, and after hydro test and flushing, and, most importantly, during system operation. 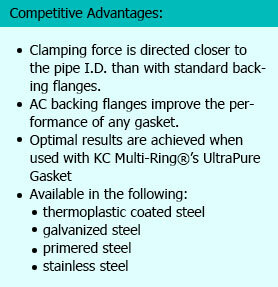 The KC Multi-Ring® backing flange will make any gasket seal better than standard backing flanges. Best results are obtained when our flange is combined with the equal gasket compression characteristics of our KC Multi-Ring® UltraPure Gasket. Please see our video link below for instructions on how to repair KC Multi-Ring flanges using minimal tooling.